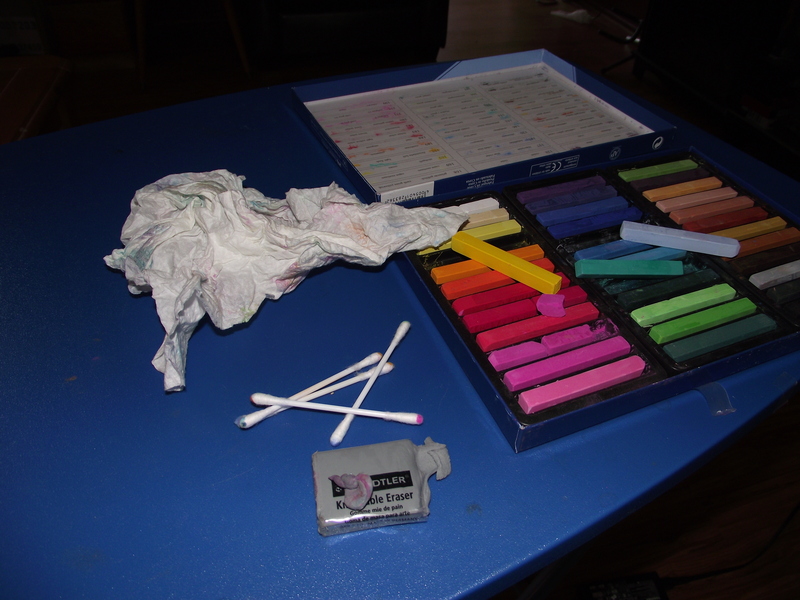 So I have this love-hate relationship with soft (chalk) pastels. I finally splurged and bought a decent set after drooling over the luscious colours in Brandy’s Fruits Gone Wild Series. Seriously sumptuous colours. The first time I used them, I loved the saturation and the blending. The second time I used them was a bit of a disaster. I don’t like disasters. They disturb me. I like things to go right the FIRST time. And the second. I’ve been known to quit altogether if I don’t “get” something right away. Another aspect of the “hate” part of the relationship is how messy they are. That powder goes everywhere. I learned a few things this time around that helped a lot. Firstly, I wiped my hands down with paper towel a lot. That minimized the smears where I didn’t want them. These little sketches are only studies, but I still didn’t want big blotches of colour everywhere. Secondly, I used q-tips to blend some of the smaller areas. I had tried them before and they just removed all the colour. This time I barely tickled the surface with them and found they were lovely for moving the powder around and manipulating the colour. Lastly, I have discovered that when it comes to pastels, a kneaded eraser is a girl’s best friend. It was terribly handy for cleaning up areas where I’d smooshed outside of the lines. The first thing I did was just block in the colours. This is where I fell in love with these luscious sticks of pigment. I found out on the first one that I need to be careful what colours I try to blend but this medium is dynamite for just getting big swaths of colour onto the piece quickly. 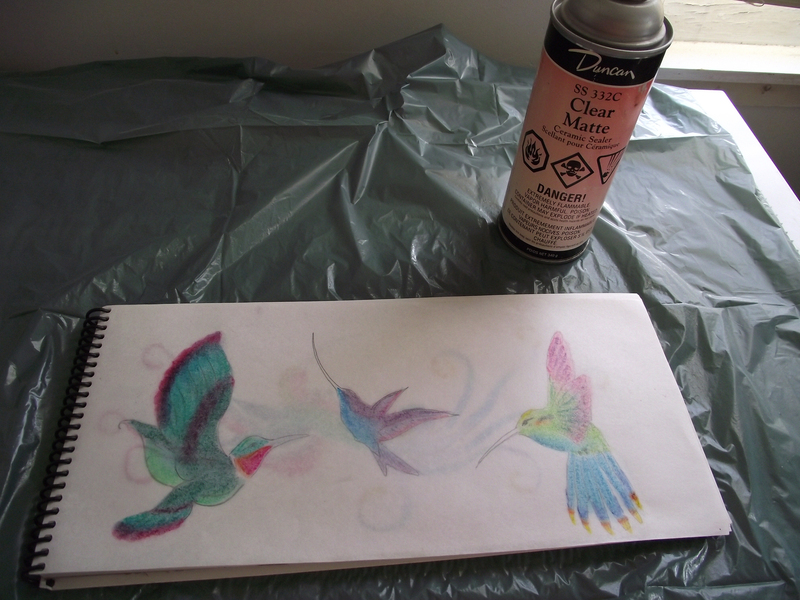 After I put the colour on, I sprayed them with a Matte sealer. As I said last time I used this, I really need to get a different brand as I’m not thrilled with what it does to the paper, but it’s what I had on hand. It did the job of sealing the powder so it won’t gum up my pens just fine, but I’d hesitate to use it on a project piece. All that was left now was to add a bit of detail with some ink. I use Staedtler Pigment Liners that are Archival and Acid-free. These have worked out nicely as a way to experiment a bit before committing to a full-sized piece. 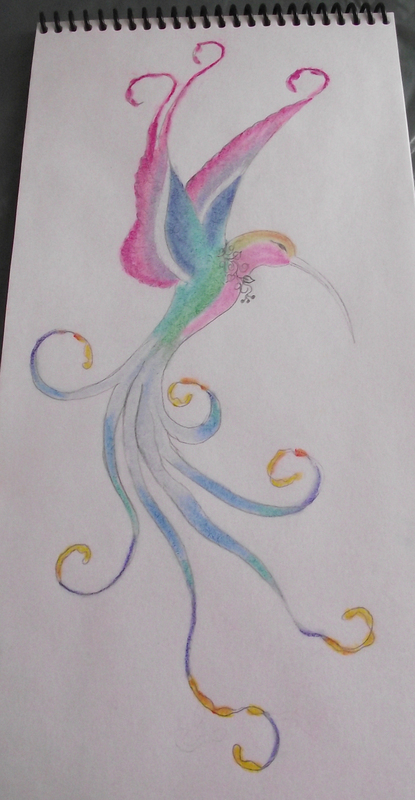 I’m definitely going to be doing some more work with hummingbirds. As a final note, I’m not going to be posting regularly on Fridays anymore. Our Fridays are becoming increasingly busy so I need to cut myself a break and not fret so much about not having a post because life has intervened. Conversely, if I manage to get something cool finished on a weekend, I just may post it then. So I’ll see you next week. Maybe with a hummingbird or two in-tow. Have a wonderful weekend! I love ’em. Hummingbirds, that is. 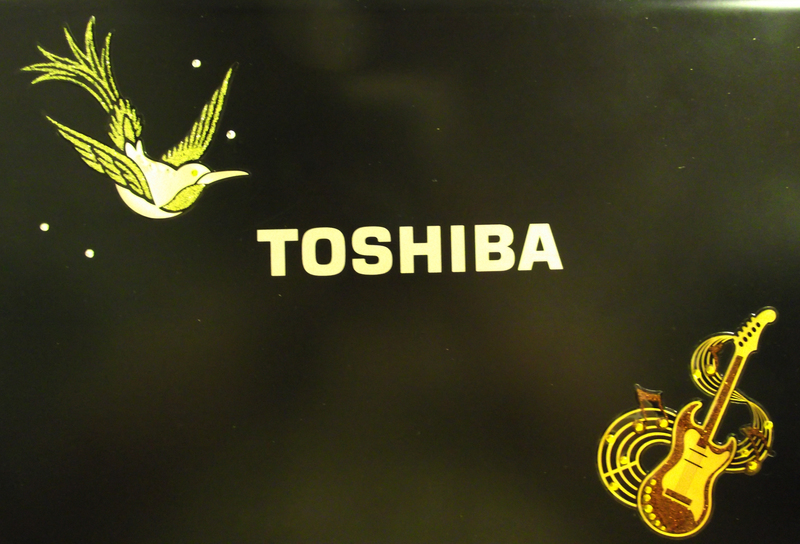 There’s even a semi-tacky sticker of one on my computer. Yes, really. Sue me. These little birds fascinate me. When I worked at the Glass House as a tour guide they would sometimes end up in the house, having flown in through the open gift-shop window. They’d be fluttering on the windows and I’d very gently cup my hands around them and take them back outside. If you’ve ever looked at one of these beauties up close you’ll know that they positively glow. Their tiny little feathers are pearlescent/iridescent and they look as soft as thistledown. And they hover….they freaking HOVER! How cool is that? 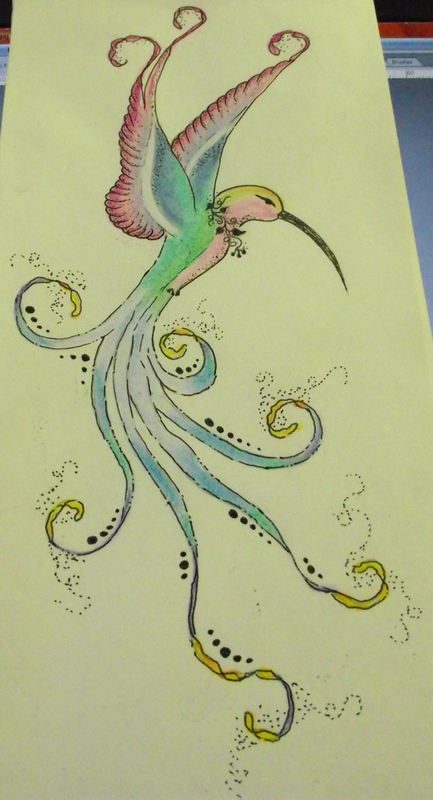 I want to do some hummingbird art. Maybe pastels, maybe folk-art, maybe watercolour. I’m not sure yet which medium so I did up some quick little hummer-sketches. These were just to get a bit of a feel for form and line. Of course, I’m likely to head in a direction that’s a little more whimsical….. So stay tuned….colour coming soon. Yup. I am. Over the weekend I went to watch a girlfriend’s band. We stayed over and had a weekend of pub food and beer. I ate all those things. The difference, however, is that I ate smaller portions of those things. I asked for the take-out containers and used them. I also fortified my diet with lots of fresh fruits and vegetables. I knew in advance I was going to be eating out a lot this weekend so I planned for it. I made sure that I was extra-careful in the days before and after my trip. A loss of 1.4 lbs. Total loss of 6.2 lbs. Maybe I’m a good girl after all. This is one of my go-to recipes when I don’t really feel like cooking but I need a meal. It also works when I just want something salty and cheesy and doesn’t feel like diet-food. I love nachos. Who doesn’t? But the pub-style nachos loaded with ground beef, sour cream and guacamole just won’t work. Unless, of course, that’s all I eat for an entire day. This is my version and they’re just yummy. Arrange Scoops cup-up on a plate and top with grated cheese. Microwave until cheese melts, approx. 1 – 2 minutes. Top with sour cream, salsa, and jalapenos. 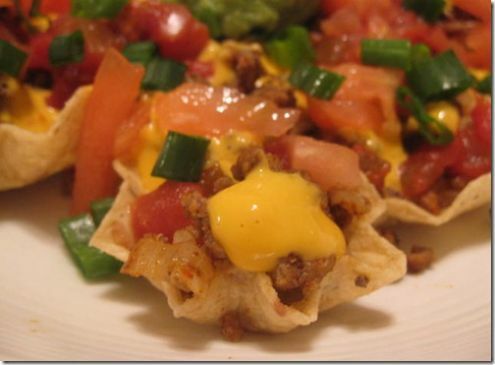 This recipe is 8 Weight Watchers PointsPlus points. To add extra protein, brown 4 ounces of ground turkey and add 2 tbsp taco seasoning and 1/4 cup of water. Simmer until moisture evaporates and add to nachos while hot. This will up your points to 11 per serving but really makes a meal. So if you’re looking for a healthy snack or meal that feels naughty, but really isn’t, try these … and the bonus is you won’t feel icky after eating them. If you’re anything like me, you’ve probably been raised on “traditional” chili. You know the stuff I mean….it has ground beef and kidney beans in it. If you’re from the Southern U.S., it likely doesn’t even have the beans but rather just chunks of chuck or sirloin. They’re both good and make for a rib-sticking meal. These days, however, we’re trying to eat lighter and I’ve been working really hard at getting more vegetables into our diet. One of the results of this is what I call Double-Chick Chili. The two “Chicks” are chicken and chick peas. It’s adapted from a Weight Watcher’s cookbook and has been run through the points-plus calculator. 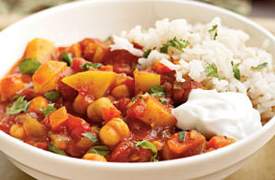 Even if you’re not watching your weight, you might want to try this chili. Seriously, this stuff is addictive. I’ve made it 4 times in as many weeks and we just can’t get enough of it. Give it a whirl. It’s something you can feel good about. Chop all veggies into 1/2″ pieces and saute in the olive oil in a dutch oven or 8-quart pot until just softened. Add chicken and saute until it’s no longer pink. Combine the flour, chili powder, cumin, cocoa powder and cayenne and sprinkle over veggies and chicken. Cook, on medium heat, stirring constantly, for one minute. Add crushed tomatoes and diced tomatoes and bring to a boil. Reduce heat and simmer 30 to 40 minutes, until nicely thickened. Add balsamic vinegar and chick peas and simmer another 10 minutes. Season to taste with salt and pepper. Makes 8 servings of 1 1/2 cups at 5 PointsPlus. I serve it with brown rice and like many chili, stew, and sauce recipes, it’s even better the second day.